The Ontario Council on Community Interpreting (OCCI) will provide copies of their brochures free of charge. Offered in over a dozen languages, "Working with your Professional Interpreter" explains what interpreters do and how to find them, describes the ethics that interpreters follow, and addresses frequently asked questions. Not every workplace needs badges for interpreters, but many interpreters find them helpful. For contract interpreters, they add a cachet of professionalism. For bilingual employees, putting on an interpreter badge helps to identify which role they are in. For a federal document in 38 languages saying (for example), "Check here if you speak Arabic" in both English and Arabic, so that a client could point to his or her own language, click here. The material can be downloaded at no cost, then printed and laminated to be used as posters. The U.S. Social Security Administration has an attractive poster in color available in 20 languages on the Internet in a pdf file that could be printed on large paper (20" X 32") and laminated. It reads: "We provide free interpreter services on request to conduct your Social Security business. Please call us first so that someone who speaks your language will be available to help you." A list of this statement repeated in 20 languages follows. The poster is available here. The Massachusetts Department of Public Health has similar "I Speak" sheets available on its website in 31 languages saying: "You have a right to a medical interpreter at no cost to you. Please point to your language. A medical interpreter will be called. Please wait." To see the website, click here; scroll down to the section sub-titled "DPH Interpreter Services Poster." The Ohio Office of Criminal Justice Services has a professional 15-page color pdf file and print language identification guide. The publication includes 56 languages. For each language the resource says, for example, I SPEAK CAMBODIAN in the language itself and then is identified by the English word for that language. This publication is available at no charge by clicking here. A state jobs site in Florida has signage information available in 21 languages via the Internet. It reads "Attention! If you do not speak English, or if you are deaf, hard of hearing, or sight impaired, YOU can have interpretive and translation services provided at no charge. Please ask for assistance." in 21 languages. However, one should be cautious about the accuracy of this poster. Download from here. 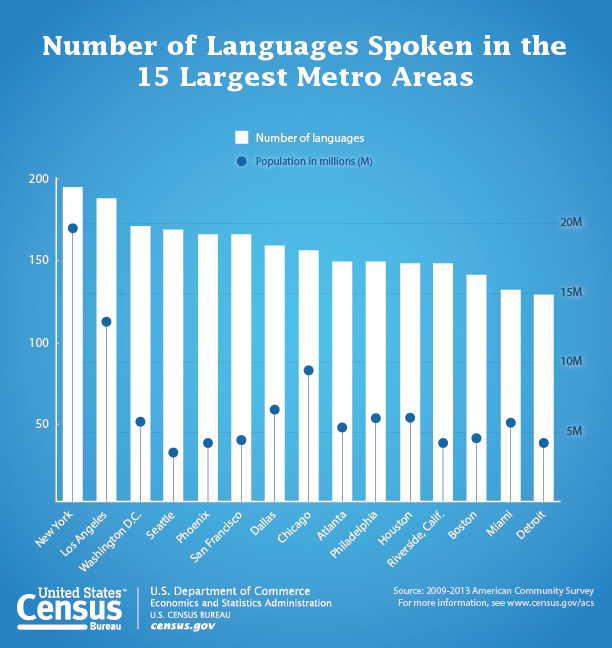 This handy poster shows how many languages are spoken in the top 15 metro areas of the U.S.
For free "I Speak" cards to give to clients that identify the client's language and correct spelling of his or her name, click here. Any office can print these cards from the website at no charge: instructions are given on how to print and laminate the cards. Available in 9 languages. Cross-Cultural Communications is the only national training agency in the U.S. devoted to community interpreting and cultural competence. It is also the only organization that licenses community interpreter trainers across the U.S. and in other countries. In addition, we write and publish a variety of training materials.